FOX Sports North, in conjunction with the University of Minnesota, the National Collegiate Hockey Conference (NCHC), and the Western Collegiate Hockey Association (WCHA), Tuesday announced an extensive 2018-19 college hockey television schedule featuring Bemidji State University, Minnesota State University, St. Cloud State University, the University of Minnesota Duluth, the University of Minnesota, the University of North Dakota and the University of Wisconsin. The 39-game schedule features 31 men’s games and eight women’s matchups. 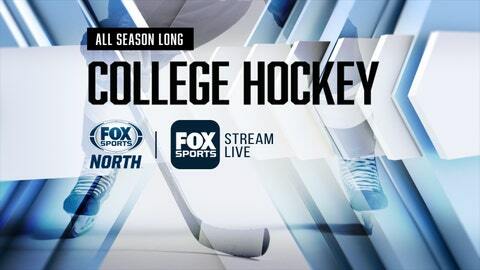 “College Hockey on FOX Sports North” begins Sunday, Oct. 7, as the University of Minnesota hosts Minnesota Duluth at 7 p.m. This season, 15 games will originate from the University of Minnesota, all of which will feature veteran play-by-play announcer Doug McLeod and analyst Ben Clymer in the broadcast booth, as well as new sideline reporter Katie Emmer. In addition, 12 games will be televised from St Cloud State University and presented by the Emmy-award winning St. Cloud State video program, Husky Productions. Jim Rich of FOX 9 will handle play-by-play alongside former Gophers All-American Pat Micheletti. FOX Sports North will televise three matchups on Saturday, Jan. 19 as part of the network’s 13th Annual Hockey Day Minnesota event – a 1 p.m. outdoor women’s game between Bemidji State and Minnesota State and a second women’s matchup at 4 p.m. between Ohio State and Minnesota Duluth, followed by a 6:15 p.m. men’s showdown between Western Michigan and St. Cloud State. Oct. 7 Sunday Minnesota Duluth at Minnesota 7 p.m.
Nov. 3 Saturday Women: Wisconsin at Minnesota St. 2 p.m.
Nov. 10 Saturday Minnesota at Wisconsin 7 p.m.
Nov. 23 Friday Michigan St. at Minnesota 7 p.m.
Nov. 30 Friday Ohio St. at Minnesota 7 p.m.
Dec. 1 Saturday Ohio St. at Minnesota 4 p.m.
Dec. 8 Saturday Women: Wisconsin at St. Cloud State 2 p.m.
Dec. 8 Saturday Nebraska-Omaha at St. Cloud State 6 p.m.
Jan. 5 Saturday Penn St. at Minnesota 7 p.m.
Jan. 19 Saturday Women: Bemidji St. vs Minnesota St. 1 p.m.
Jan. 26 Saturday Wisconsin at Minnesota 7 p.m.
Feb. 9 Saturday Colorado College at St. Cloud State 6 p.m.
Feb. 23 Saturday Notre Dame at Minnesota 4:30 p.m.
March 1 Friday Arizona St. at Minnesota 7 p.m.